Imperial Beach is the southern most beach in San Diego before the border. 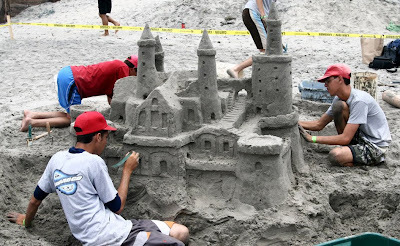 I'd never been there before, but I drove down today to photograph the US Open Sandcastle Competition. 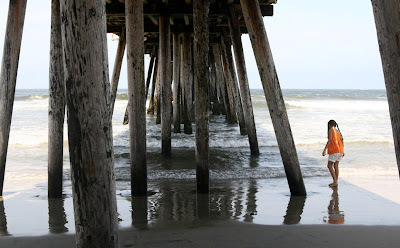 However my favorite photo wasn't of a sandcastle, but rather of a girl ambling under the old wooden pier. The photo didn't capture the depth as well as I'd liked. In real life, the wooden beans faded into the distance, almost lost in a blue mist towards the end. The event was packed; surprisingly lots of people - low thousands perhaps? I'm bad at estimating these things. I didn't stay for the judging. But there were some 20 competitors, each with a caution-taped off square of, oh, 20 x 20 ft? Teams of on average 6 people worked on castles of all different themes. The picture below isn't the most artistically interesting pic, but I figured I ought to post a photo of a sandcastle.